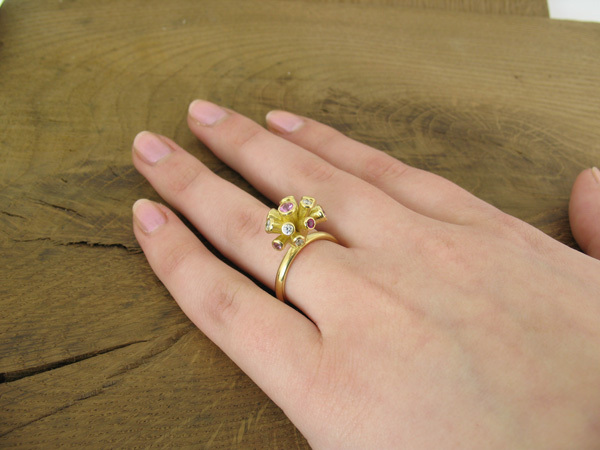 Anemone ring in diamond and pink sapphires, in 18ct yellow gold. This is the very first one made! The rub over settings encapsulate the top quality diamonds. We have used two shades of pink sapphire; baby pink and deep magenta (verging on ruby). The ring is exquisite in real life, like a tiny bunch of exotic flowers. The curving array of stems, finishes in diamonds and sapphires which catch the light and sparkle, because they are set at varying angles. These rings can be ordered to any size, in any metal and with any gem. They’ll all fall under the Anemone Collection umbrella, but each one will be made to order. The ring itself is an elliptical court shape, measuring 2.8mm. It’s supremely comfortable to wear and can be made to any finger size. Click on the Collection pages to see more pictures. Contact us to place your order and we’ll make one just for you.